Here are some facts about the Sydney Opera House in Australia. Sydney Opera House is one of the world’s most well known and instantly recognizable live music venues. It is located in the northeast of Sydney’s central business district. Over 7 million people visit the Opera House every year, making it one of Australia’s biggest tourist attractions. About 1.2 million of these attend a performance. 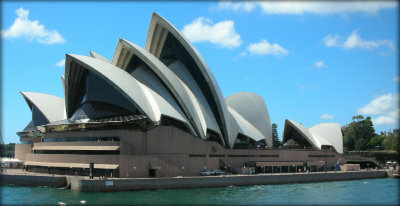 The Opera House was designed by Jorn Utzon, an architect from Denmark. The main concert hall can seat almost 2,700 people and contains one of the world’s largest organs – it has 10,000 pipes. One of the 1,000 rooms in the opera house is named the Utzon Room (after the building’s designer). It contains a woolen tapestry, made from enough wool to stretch from Sydney to Perth, a distance of about 2,040 miles. LEGO have produced two Sydney Opera House sets. The first is part of the LEGO Architecture range (set 21012) and contains 270 pieces, and the second (set 10234) is part of the Creator theme, and contains nearly 3000 pieces. The building’s distinctive look comes from a million tiles, which were designed to be self-cleaning. The concrete roof sections, which weigh up to 30 tons each, are held in place by over 250 miles of cable. In 1997, a French climber climbed all the way to the top of the Sydney Opera House, with no ropes or safety devices, and using only his hands and feet. Arnold Schwarzenegger once appeared at the Opera House, during a 1980 body building championship. The venue has also hosted wrestling events and rock concerts, in addition to opera. During a 1983 performance of a Russian opera, a live chicken fell off the stage and landed on the head of one of the musicians. Safety nets were installed to prevent things like this from happening again. As well as being the home of Australian Opera, the Sydney Opera House building has had its own opera written about it, called The Eighth Wonder. What next? Discover some facts about Sydney Harbour Bridge, another of Sydney’s famous landmarks. THANK YOU! this is such a great website for my homework. My teacher was happy and I got a A+ and now the class and my teacher uses this now! your such a great piece of handy work!